Sarah's Rags: JWMT rug done: Next project! JWMT rug done: Next project! A lovely feeling: my father's blue/grey/heather proddy rug is turned, bound and stitched, rolled, wrapped, tied and ready for delivery. Now for the next project - a hooked rug using the speed shuttle and frame. I am making this rug for my mother who will be 88 in April. 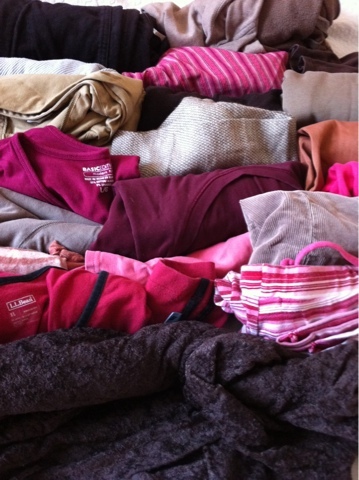 I am choosing earth tones of brown, fawn, pink and a tiny bit of grey here and there. The picture shows a stash of 20 different items of clothing gathered in from family, friends and freecyclers.